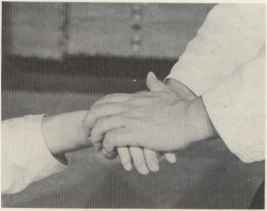 Hold the wrist of your partner in the same manner as described on page 61 of Volume 3, which deals with Ura-waza of Shiho-nage, disengage his by turning your left hand and controlling his elbow. 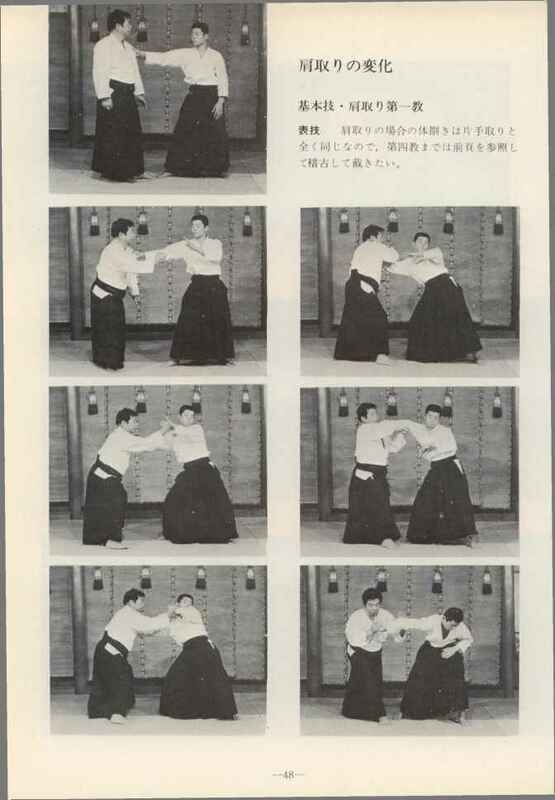 This is a variation of Kote-gaeshi. 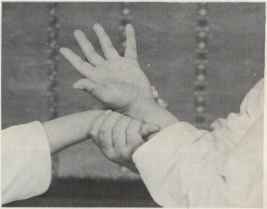 When effecting Kote-gaeshi from below your grasped hand, turn your partner's wrist out as if plucking out his thumb and hold it down for a throw. 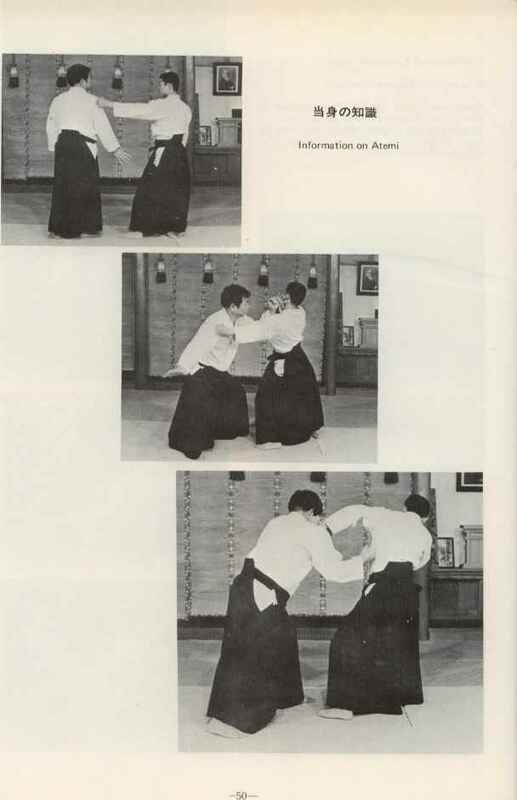 Rigorous training was popular in olden times but is no longer so. 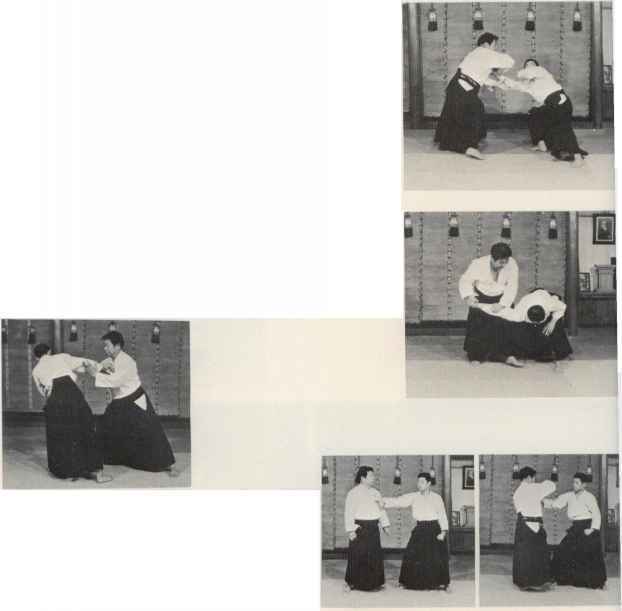 This particular training method is combative in nature and you should know what it looks like. Because of the great dangers involved, its execution must be tempered with a great deal of caution. 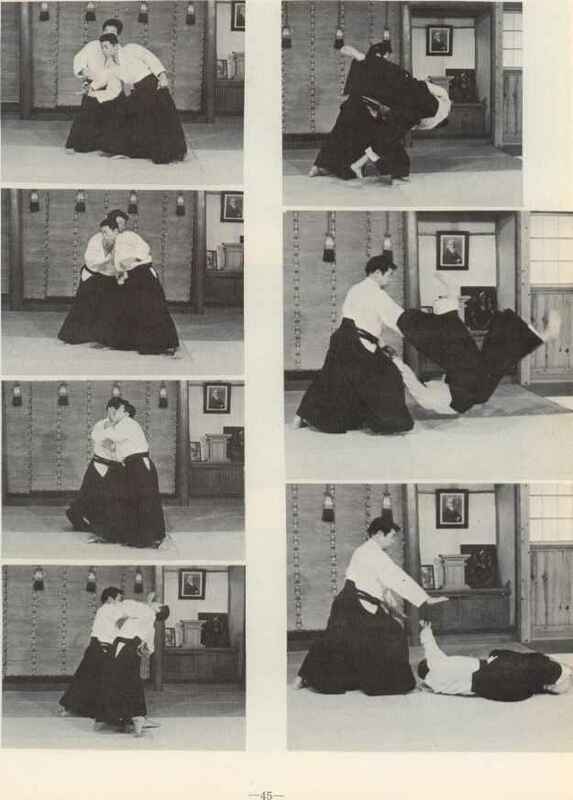 This is the rigorous version of Kokyu-nage. 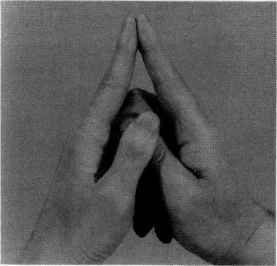 It is a dangerous technique which can cause a broken hand or a sprain to the foot. 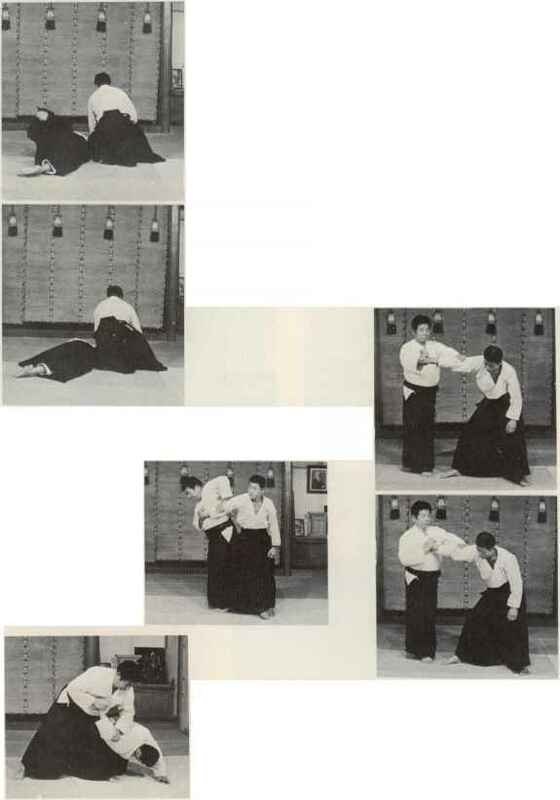 This rigorous version of Kokyu-nage is a technique whereby you grasp your partner's belt and pull him toward you, push his chin from above knocking his head down on the mat. 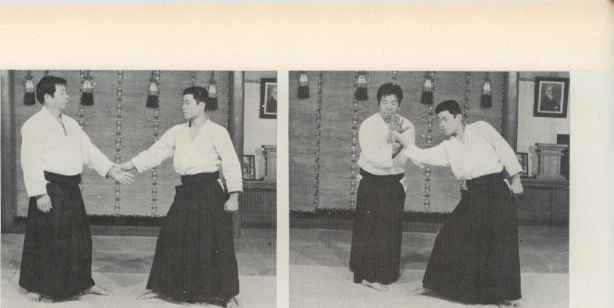 If your partner pulls your hand while in the act of Kokyu-nage, follow his move without resistance and flip him down as if pushing his chin upwards. ffitS I- =¡3 # £ A tln o (IHJ Ifii M A O T lit p ilill L, I'l1? 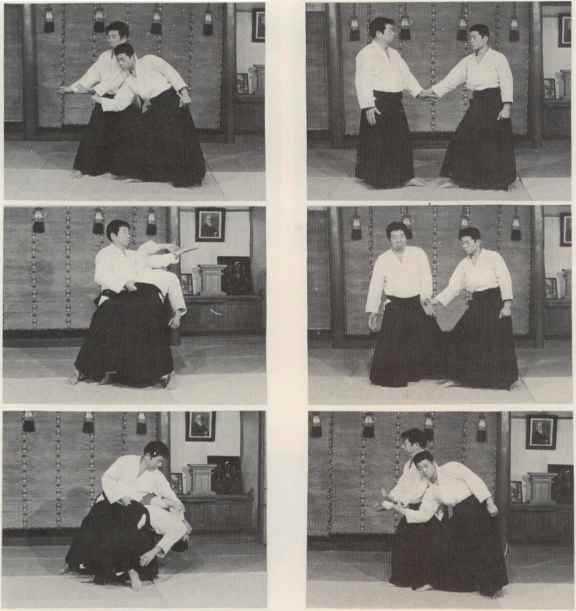 This is a technique which calls for sliding to the side of your partner while delivering a strike at his face and controlling his elbow for a pin down. 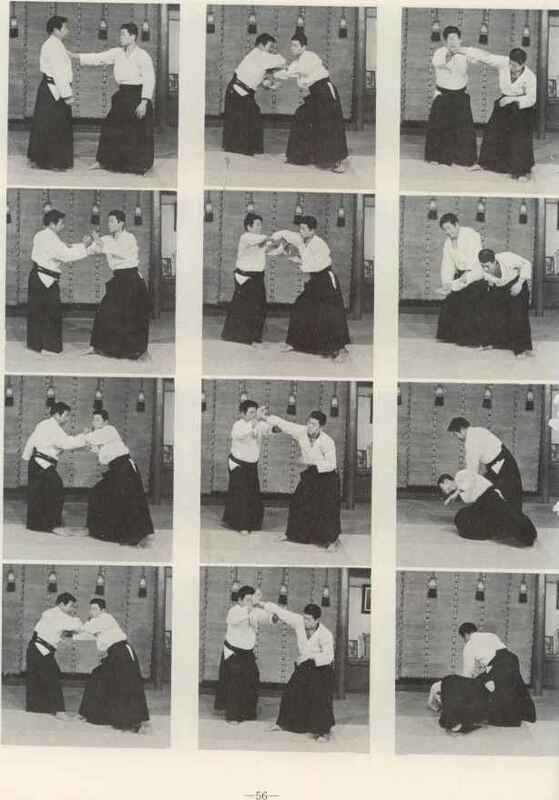 Omote-waza: Body movements in the case of Kata-dori are exactly the same as Katate-dori. 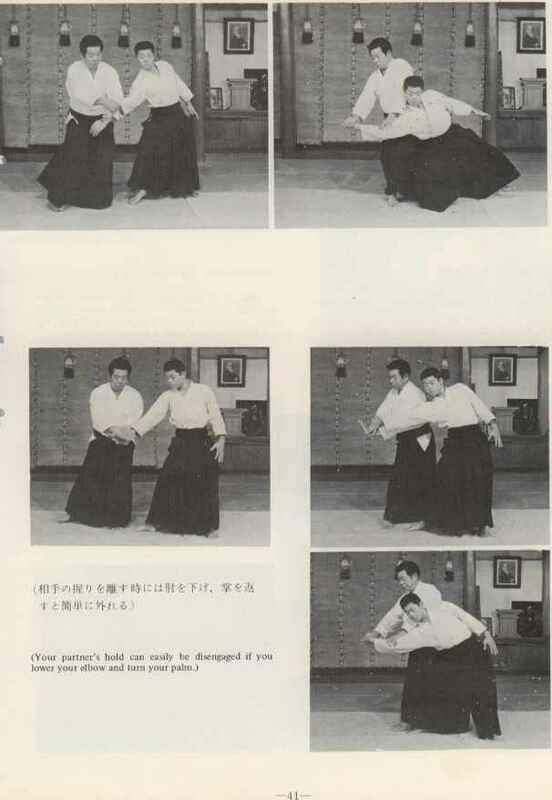 It is suggested that readers refer to the foregoing pages in practicing techniques ranging from Dai-lkkyo to Dai-Yonkyo. 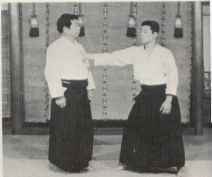 If your shoulder is held, control your partner's elbow instantly with your Tagatana and pin him down as if your shoulders were describing a spiral curve. 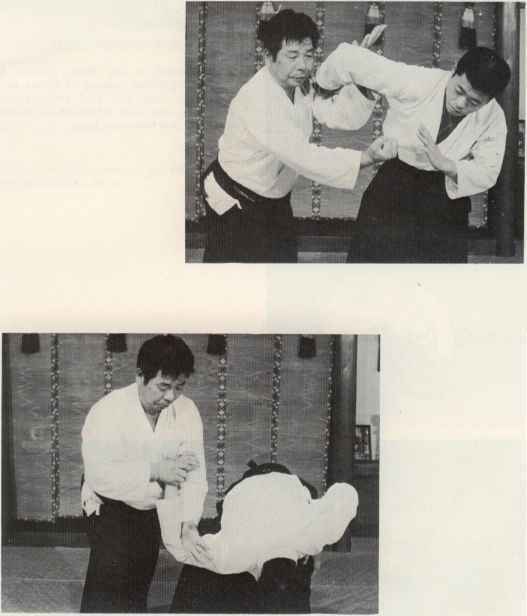 This is an advanced technique but also constitutes the basic form of iCata-dori. 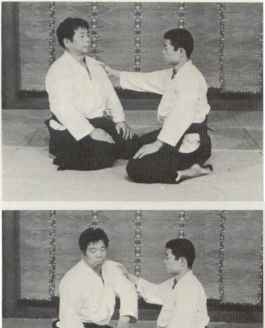 Kokyu-nage in the sitting posture. 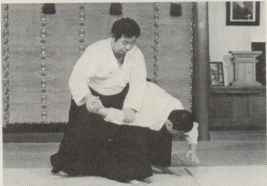 If you master the sitting versions of all the Kata-dori techniques, you will find standing exercises extermely easy. 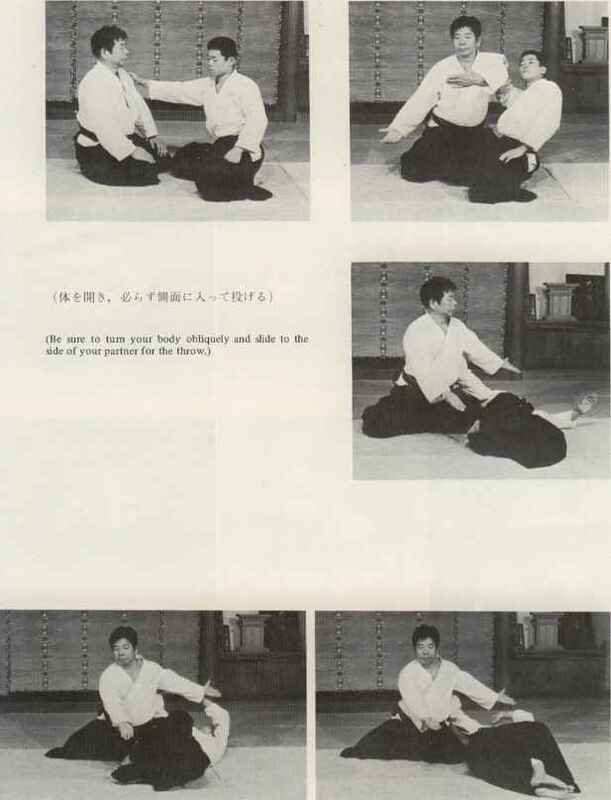 This is because the sitting exercises help you train your hips. 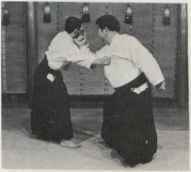 Omote-waza: Unbalance your partner sideways while feigning a blow to his face. 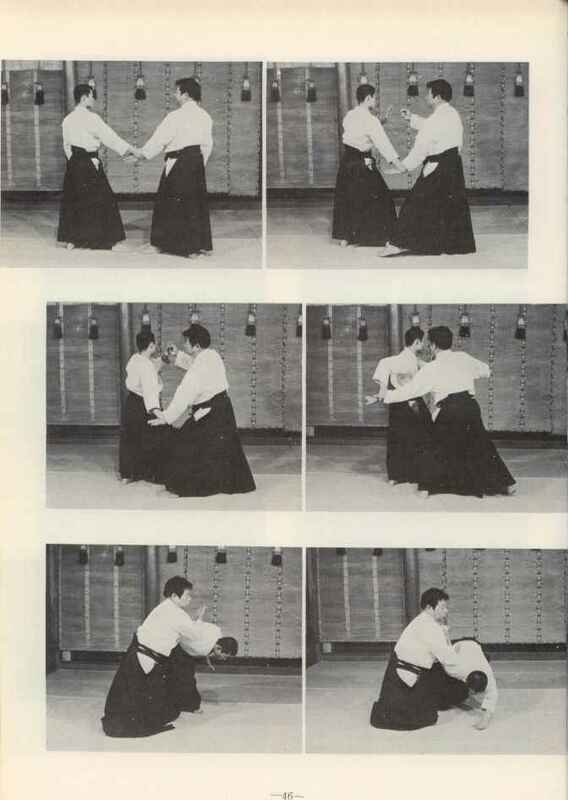 As you turn his arm, don't let your foot step out too quickly. 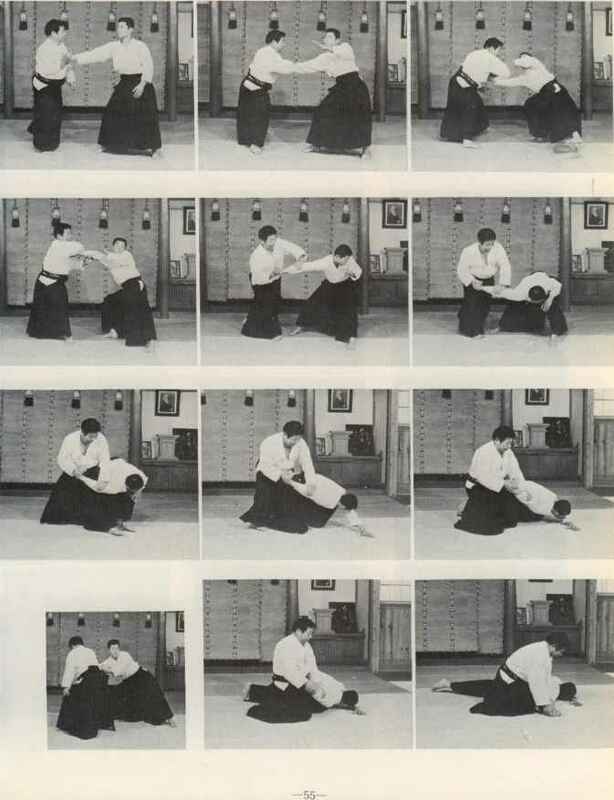 Turn your hips completely, advance obliquely in the manner of thrusting him away and pin him down.